There are one or more stones in your kidney. Stones cause pain, infection or bleeding, and can damage the kidney. The stone(s) need to be taken out. This operation is called a nephrolithotomy. You have two kidneys. They lie deep in your back on either side of your spine, in front of the lowest rib on each side. 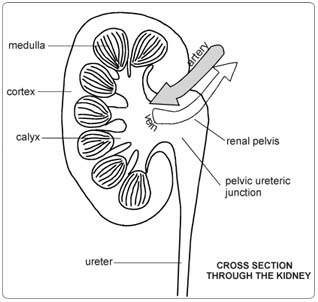 The kidneys make urine which passes down a tube (ureter) on each side to the bladder just below your tummy button. The stones usually lie where the ureter joins the kidney and can be taken out through an opening in the top of the ureter. Sometimes the kidney is so badly damaged by the stone(s) that it needs to be taken out as well. Sometimes just part of the kidney is taken out with the stone(s) to help the urine drain out of the kidney better. You will have enough kidney tissue after the operation to make urine properly. You will have a general anaesthetic, and will be asleep for the whole operation. A cut is made in the skin over your kidney, usually round the back in the line of your lowest rib. Sometimes the cut is made in the front of the tummy, especially when the kidney is to be taken out. The stone(s) are taken out, with or without the kidney. The wound is stitched up. Usually within 10 days you will feel fit enough to leave hospital provided there is someone to look after you. Leaving things as they are means that your problem will get worse. Usually the stones can be broken up with shock wave treatment or taken out using keyhole instruments. In your case these ways are not suitable. Dissolving these stones is not a the correct procedure for you. On the ward, you may be checked for past illnesses and may have special tests to make sure that you are well prepared and that you can have this operation as safely as possible. Please tell the doctors and nurses of any allergies to tablets, medicines or dressings. You will have the operation explained to you and will be asked to fill in an operation consent form. Many hospitals now run special preadmission clinics, where you visit for an hour or two, a few weeks or so before the operation for these checks. Before the operation, a tube (catheter) may be passed into the bladder to check the urine flow. In females this is done on the ward. In males this is usually done when the patient is asleep in theatre. You may feel a bit sick for up to 24 hours after operation, but this passes off. You will be given some treatment for sickness if necessary. You may be given oxygen from a face mask for a few hours if you have had chest problems in the past. You will have a drain tube coming out of the skin near the wound. This is to drain any residual blood or other fluid form the area of the operation. It usually comes out two to three days after the operation; as soon as it is not draining any more. You will have a fine, thin plastic tube (drip) in an arm vein giving you blood or salt solutions. A general anaesthetic will make you slow, clumsy and forgetful for about 24 hours. The nurses will help you with everything you need until you are able to do things for yourself. Do not make important decisions during this time. There may be some discomfort on moving rather than severe pain. You will be given injections or tablets to control this as required. Ask for more if the pain is not well controlled or if it gets worse. You will most likely be able to get out of bed with the help of the nurses the day after the operation despite some discomfort. You will not do the wound any harm, and the exercise is very helpful for you. The second day after the operation you should be able to spend most of your time out of bed and in reasonable comfort. By the end of one week the wound should be virtually pain-free. You may have some blood in the urine catheter for a day or two after the operation. Once this clears and you are able to get out of bed easily, the catheter will be taken out. It is important that you pass urine properly after the catheter is out. The doctors and nurses will check this. If you still cannot pass urine let the doctors and nurses know and steps will be taken to correct the problem. The wound has a dressing which may show some staining with old blood in the first 24 hours. The dressing will be removed and the wound will be sprayed with a cellulose varnish similar to nail varnish. You can take the dressing off after 48 hours. There is no need for a dressing after this unless the wound is painful when rubbed by clothing. There may be stitches or clips in the skin. The wound may be held together with stitches underneath the skin that you can’t see and which eventually dissolve. There may be some purple bruising around the wound which may spread downward by gravity and fade to a yellow colour after two to three days. This is expected and you should not worry about it. There may be some swelling of the surrounding skin which will also improve in two to three days. After 7 to 10 days, slight crusts on the wound will fall off. The cellulose varnish will peel off. Occasionally minor matchhead-sized blebs (blisters) form on the wound line, but these settle down after discharging a blob of yellow fluid for a day or so. You can wash as soon as the dressing has been removed but try to keep the wound area dry until the stitches/clips come out. If there are only stitches underneath the skin, try to keep the wound dry for a week after the operation.. Soap and warm tap water are entirely adequate. Salted water is not necessary. You can shower or take a bath as often as you want. The nurses will advise about sick notes, certificates etc. You are likely to feel very tired and need to rest two or three times a day for two to three weeks. You will steadily get better so that by the time two months have passed you should be able to get back to your usual activities. At first discomfort in the wound will prevent you from harming yourself by lifting things that are too heavy. After two months you can lift as much as you used to lift before your operation. There is no value in attempting to speed the recovery of the wound by special exercises before this. You can drive as soon as you can make an emergency stop without discomfort in the wound i.e. after about three weeks. You can restart sexual relations within three weeks or so, when the wound is comfortable enough. You should be able to return to a light job after about one month and any heavy job within two months. Complications are relatively rare. If you think that all is not well, please let the doctors and the nurses know. Bruising and swelling may be troublesome. The swelling may take four to six weeks to settle down. A wound infection happens in 1-2% of cases and settles down with antibiotics in a week or two. Sometimes (2-3% of cases) there is a leak of urine through the wound or from the drain site. This settles down within a week or so. Very rarely, you will need another operation to fix this problem. Sometimes stones reform. This will be discussed with you.